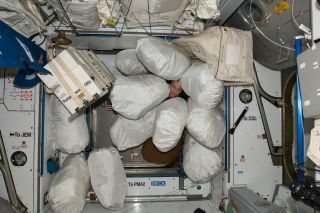 NASA astronaut Don Pettit poses with stowage bags on the International Space Station in 2012. That's why NASA, in partnership with the company NineSigma, created a Recycling in Space Challenge to encourage the public to think of ways of processing and feeding trash into a high-temperature reactor. This will allow NASA's Advanced Exploration Systems directorate (which develops prototype systems and validates operational concepts for human exploration), as well as the agency's space technology programs, to develop methods to recycle waste and convert the trash into useful gases. Three winners were selected from a NASA Tournament Lab crowdsourcing challenge, according to a statement from NASA. Aurelian Zapciu, Romania — $10,000 for first place, Waste Pre-Processing Unit. This uses space-saving features, as well as ejectors that are cam-actuated (they use a rotating or sliding piece in a mechanical system) to move trash through a system. Then, another mechanism brings the waste products into a reactor. Derek McFall, United States — $2,500 for second place, Microgravity Waste Management System. This uses a hopper to deal with solid waste, as well as controlled air streams for liquid and gaseous waste. Ayman Ragab Ahmed Hamdallah, Egypt — $2,500 for second place, Trash-Gun (T-Gun). This uses air jets to compress trash before moving it through the system, overcoming the problem of operations in microgravity, where everything floats and makes compression difficult. "The challenge produced ideas that were innovative and that we had not yet considered," Paul Hintze, a judge for the competition, said in the statement. Hintze is also a chemist with NASA's Kennedy Space Center exploration, research and technology programs. "I look forward to further investigating these ideas and hope they will contribute to our human spaceflight missions." Learn about the NASA Tournament Lab (including how to participate in the lab's challenges) here; read about more citizen science opportunities and challenges at NASA here.